Want to get rid of those old pallet tables, chairs, and shelf? Here are the wonderful and easy ways to up-cycle your garden with those old pallets in your home. In this article, we discuss the various DIY Pallet Garden which is easy to do, less time consuming for less price. This Pallet Garden is used mainly to plant the seeds on the dirt. Arrange the pallets in a square shaped space, then put some dirt. Pour water and plant the seeds. See your plants grow into a wonderful garden. For a funky look in your garden space, use pallets and join it together horizontally. Then create a pathway. It will surely create the more rustic look to your garden. Vertical Pallet Garden takes up only less space and can produce more growth. Maximum space is utilized in both vertical and horizontal garden space. 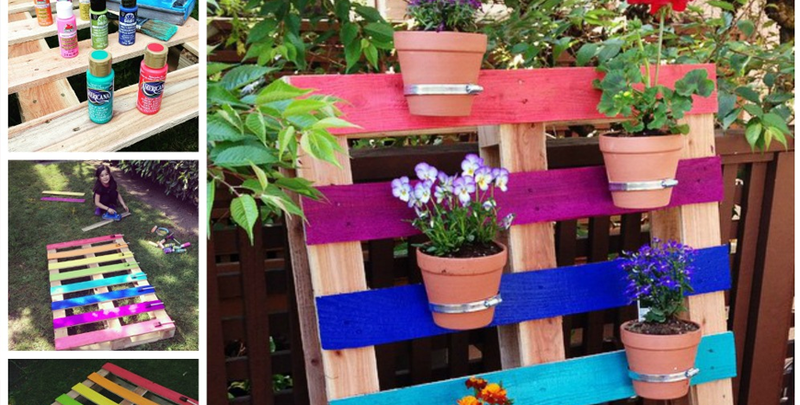 Paint your Pallet with your favorite color; attach some hooks in these pallets. Hung your favorite flower pots and see them grow. This could also be used to hang your coffee cups. Join four old pallets together like a box. Attach them with screws and glues. Now, place a glass according to the size of the box. It could be used as a greenhouse and could be a great idea if you are living in a cold climate. Don’t have enough space to grow plants? Here is the best idea. Make a box of the pallet using the recycled pallet. Drill small holes for drying up the water. Attach this box below the window, and grow your plants in this box. This could be very useful if you are living in an apartment and there is not much space to grow a garden. Watch this space for more articles and DIYs.